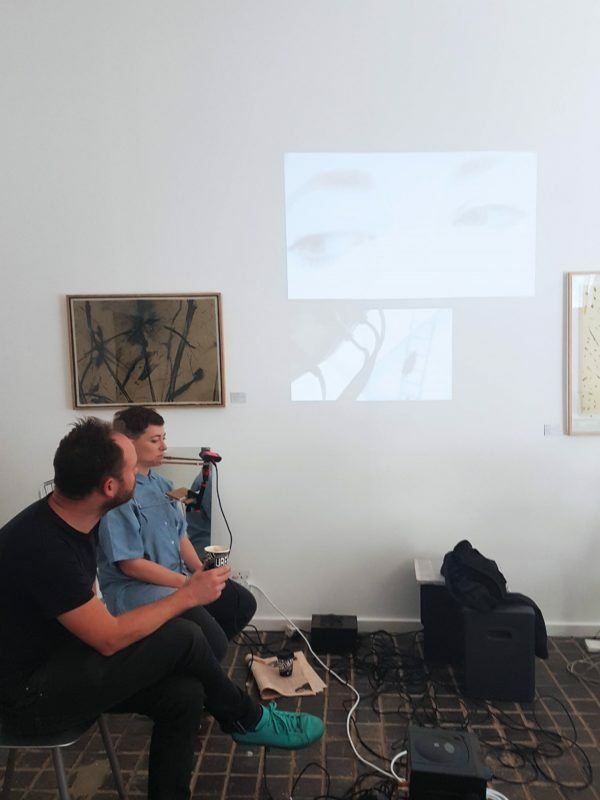 On Sunday 19 November 2017, David Krut Projects in Cape Town hosted an audiovisual showcase called Never Read the News Alone. 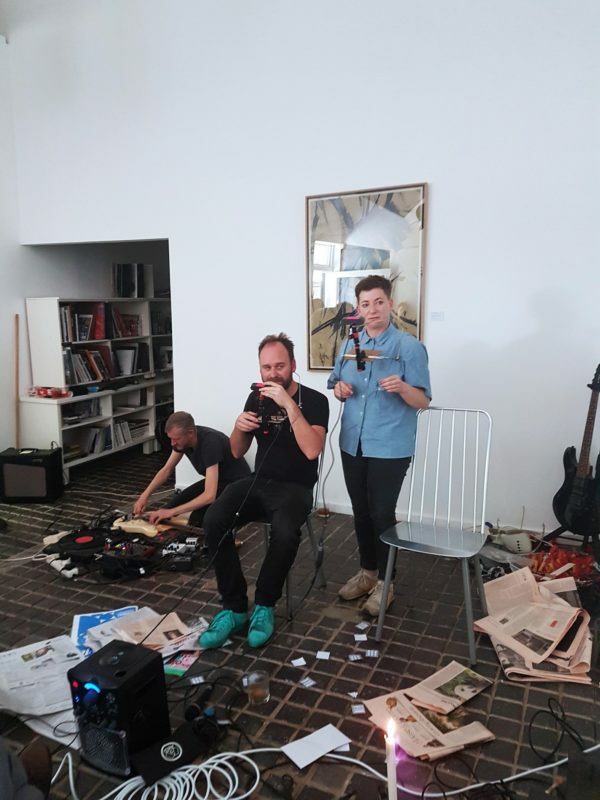 The event contained a reading of various newspaper articles by two artists to a captive audience that was also treated to the sounds of live musical experimentation from three musicians. Current showcasing artist Jacob van Schalkwyk turned the Montebello Design Centre into a laboratory space for experimentation as part of his exhibition DOLCEFARNIENTE. Joining him in the experiment was the recent winner of the 2018 Standard Bank Young Artist Award for Theatre, Jemma Kahn. A Fine Art and Drama student of Wits, Kahn is known for her play Bocca Al Lupo that was performed in Japan and the Market Theatre in Johannesburg, and the audiovisual showcase was for her a preparation for her new production One Ply which will premiere at the National Arts Festival next year. 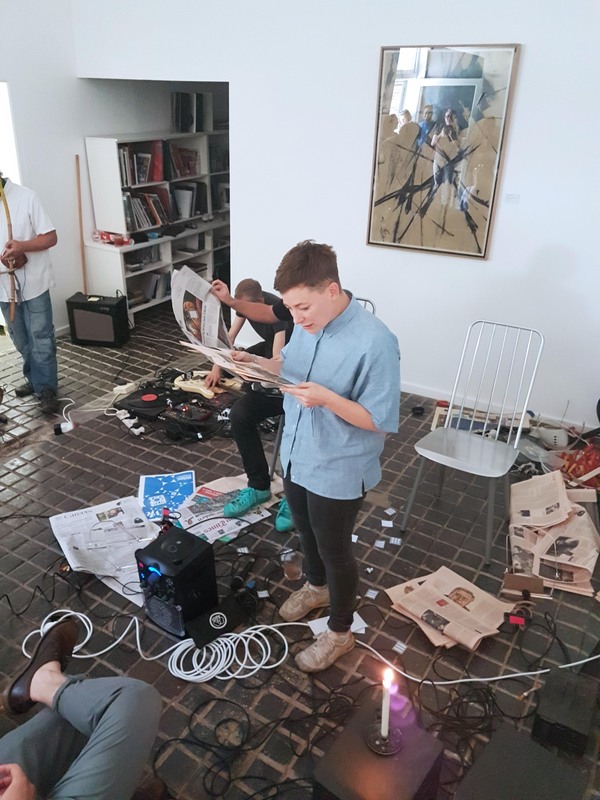 Three musicians performed in what renowned Cape Town multi-instrumentalist and visual artists Garth Erasmus described as ‘spontaneous composition’. Erasmus is known as a visual artist for his work with the Thupelo Workshop at Greatmore Studios in Cape Town, and as an art teacher at Africa South Art Initiative (ASAI). His equally legendary musical talent showed at this event when he played the saxophone and a traditional musical bow. On the electric guitar was Dylan Graham who is a member of the band Die See. Graham also has a solo exhibition of paintings currently showing at Fried Contemporary in Pretoria. On the electronics and devices was Cape Town ‘king of noise’ musician and photographer, Justin Allart. The music started with blaring sounds from the electric guitar and screeches from the saxophone in alto. Although Justin Allart was barely visible from his position on the floor, where he was controlling the keyboard and several other devices, he was no doubt also responsible for bringing the noise to the space. The music was loud and entertaining to watch as Garth Erasmus and Dylan Graham could be seen bouncing their melodies off each other. Their ‘spontaneous composition’ was exceptionally interesting as the musicians could be observed as masters of their instruments in the way they improvised melodies and rhythms without missing a key. The musicians had only met a day before to practice and hear each other’s sounds, and Erasmus later explained that their rehearsal sounded totally different to their performance. Their mastery of composition was noted as truly remarkable. Then the music became softer and it was time for the news to be read. Jemma Kahn started proceedings with an article about a man who tried to bring frogs and wildlife to his homemade pond, but his pond was attracting the wrong species. The article detailed the man’s attempts at ethnic cleansing his pond and Kahn was evidently humoured by this ecological racism. Jacob van Schalkwyk then read about South African government cabinet bribes of R48 million for six ministers’ houses. He read the article humorously to highlight the ridiculousness of the Herculean amounts of corrupt money that has become normalised in the top levels of government. The news readers and the musicians then began to take turns in being the centre of focus. The musicians would play their music and then became quieter for Kahn and van Schalkwyk to read in turns. They each read a tech report, Kahn about Silicone Valley and Mark Zuckerberg, and van Schalkwyk about the website MySpace soaring to new heights. Jemma Kahn then read an article called ‘Panda Power’ which detailed world leaders such as Xi Jinping and Angela Merkel’s discussions on how to treat newly born pandas in a Chinese zoo. Van Schalkwyk’s last article was on the subject of Anthropology, and the writer was describing hunter-gatherers as the original affluent society. The music then continued to play until an interval at 12pm. People relaxed, chatted, and enjoyed the free Bloody Marys that were being served outside. The interval was 45 minutes until the performance started again with the musicians continuing their spontaneous composition for about 30 minutes. All the while the performance had been filmed and live streamed to Facebook with the technical support of JHB Live. Never Read the News Alone was a thoroughly entertaining audiovisual experience that Cape Towners enjoyed on a pleasant Sunday morning. 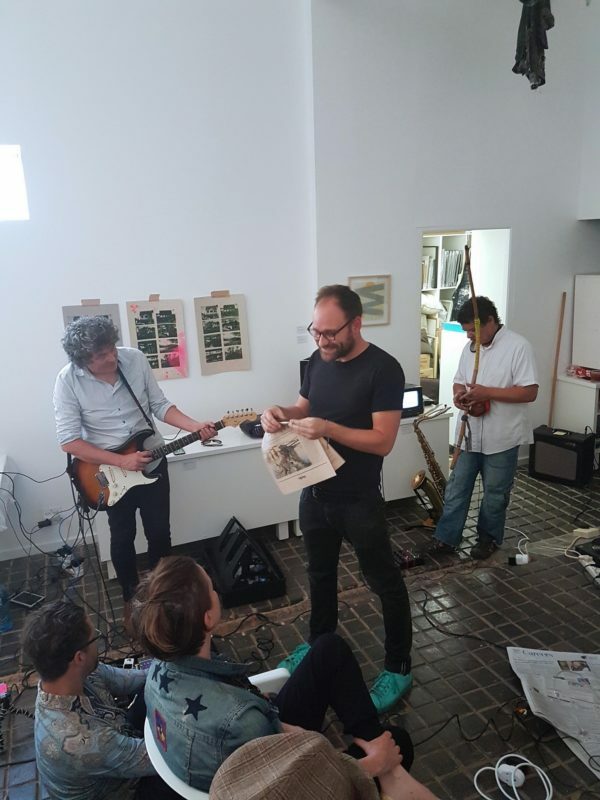 The grooves of the music put people in a good mood for the rest of the day, and with thanks to van Schalkwyk and Kahn, as well as David Krut Projects Montebello venue, the Cape Town art scene was alive and well right up until the end of the weekend.